Doomers often imagine a Hollywood like scenario where the oil runs out on Wednesday and the power grid fails on Thursday. By the following day everyone is chewing on the buttocks of the local populace. The reality is quite different. Apart from the highly unlikely scenario of suddenly 'running out' of fuel to keep the power stations going, the grid system doesn't in fact tend to be quite such a hit a miss affair. Firstly, power stations are brought on and offline, thus allowing for breakdown and failure and to balance load. Second even in the event of power shortage governments tend to have plans to keep essential services working as far as possible. Generally major infrastructure such as oil pipelines, waterworks and hospitals are regarded as vital. Current from power stations is stepped up onto grid voltages and transmitted across long distances. There are two types of grid: The transmission grid and the distribution grid. For example, in the UK (England and Wales) the high voltage 400 kv 5800km 'supergrid' which moves bulk power supply around the country from power stations is run by National grid Transco and is under the supervision of the electrical controllers at their control centre near Wokingham, Berkshire. 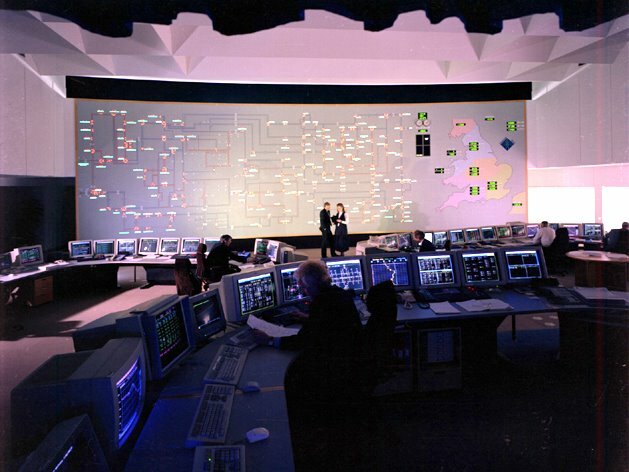 The voltage is stepped down and then distributed by local electricity companies (EG EDF, Southern Electric) under the supervision of their electrical controllers to local consumers. Domestic customers receive a 240 v domestic supply, industry receives a higher supply voltage (usually 400 v) and electrified railways receive power at 25 kv or below (EG Network rail, London Underground) depending on the local arrangements. The bus bars of their feeder stations are controlled by their own controllers. Switching is done via heavy duty circuit breakers, remote or manual switches on grid station bus bars and local distribution networks. Control is via mimic diagram or more usually SCADA (System control and Data Acquisition) workstations which oversee the state of the breakers and switches as well as load information. You can even get some of this electricity demand information on-line. The system is under constant supervision and customers can be switched in and out, in order to balance the loads in an emergency. If a tree falls on a power cable or it is stuck by lightning, or the load exceeds the rating of a circuit breaker, this usually results in a 'tripping'. The circuit breakers are opened automatically and in some cases alternative switching arrangements can negate the problem. This is not to say the system cannot catastrophically fail, as it did on the 28th August 2003. The official report is here. But the grid falling over on a permanent basis or cutting vital customers off because of fuel shortage is an urban myth. I think even Mike Ruppert has said that initially, and for some time, the grid will blink on and off--may be on for a few days and then it will go off. This may be controlled, it may not. Eventually, there will be a point where it disappears permanently, but there will be plenty of warning that it's coming. Oh sure the government always have nice plans to deal with all sorts of emergencies and keep essential services running. There are all kinds of plans printed on paper, stock piled 10 feet high in a room some where. The plan is so detailed that it describes how to make sure every one has three hot meals and one hot shower a day, in the case the whole of New Orleans is submerged in water, for example. They also have plans to make sure people can promptly obtain gasoline and food after a hurricane in Miami, instead of having to wait 12 hours in line. Oh nice government plans one could only dream up. In an oil crisis and there is a shortage of electric power. The most vital services that's top of the priority will be the electricity supply to oil refineries, oil drilling rigs and platforms, oil pipelines and gas stations. Leaving even the hospitals as only a second or third priority. FEMA is quite screwed up right now, so I understand your apprehension [Brownie did a heck of a job, didn't he?] :-( . But most countries have emergency management plans for bringing the power grid back on-line in an orderly fashion. The 2003 blackout was not a permanent affair, as you know. In fact, most areas had their power back within 3-4 days. Furthermore, some parts of my home province of Nova Scotia lost power for 2 weeks due to Hurricane Juan in 2003, and power in Quebec was out for up to 1 month due to the Great Ice Storm of 1998 and things didn't fall apart in either case. Oil may be expensive in the future, but it won't stop governments from moving Heaven and Earth to ensure mission-critical services stay operational. Doomers (like myself) don't worry so much about running out of electricity. We worry about running out of diesel for trucks and agriculture. I can survive without a computer or TV, hell if I have to I can manage without a refrigirator. But without diesel for trucks there will be no food for me to buy, period. I tend to take what novelists and writers say with a pinch of salt. Bucket in his case. After witnessing the government ( on all levels) completely fail to prepare for or respond to a crisis they knew was coming (Katrina), I was a bit concerened. But after reading this plan, I fell reassured. I'm sure people think it all happens in a week, because that's how they see things in the movies. Ironically most chief peak oil big wigs are writers who have no technical background. "Oil may be expensive in the future, but it won't stop governments from moving Heaven and Earth to ensure mission-critical services stay operational." Expensive oil is an end result of scarcity, not the cause of scarcity. It is not a case where it is expensive but available. It is a case it's mostly unavailable and so expensive. The government can move heaven and earth, but it must consume diesel energy to be able to move any earth at all. When there is not enough diesel to transport all the vital food and other goods around, the government will not have any spare diesel to move heaven and earth, either. The best the government can do is sit and do nothing so as to save more fuel. Any more on the government's part will only result in more fuel consumed, making the problem worse. When there is not enough diesel to transport all the vital food and other goods around, the government will not have any spare diesel to move heaven and earth, either. You don't get it. Go outside and take a look at a busy street. You will see lots of people driving around, wasting fuel. Take a look at this energy flow diagram for the US. Oil makes up 39.2 quads of the 97 quads of energy used in total, which is less than half. And the United States uses twice as much energy per capita as Europe. So from a simplistic perspective one would imagine the US could do quite well with far less oil (like Europe does), or ultimately with no oil at all. Now let's look at what all that oil is actually used for. Of the 39.2 quads, 25.6 is used for transportation. Of that , 21.2 is wasted. Why? Because most transportation oil is used in private automobiles, and the average car occupancy is 1.2, and most cars are terribly inefficient because they are so large and badly designed. In fact, oil use in private cars uses up every single drop of America's petroleum imports. Without the car, it could do fine on its own oil. Now, I know what you're saying. America's oil production is long past peak, and is declining. But proven alternatives like coal liquefaction are yet to be employed. Even if 100% of America's imported oil disappeared overnight, there would still be enough to run essential services such as food production and transportation, and making plastic doodads (and providing the 2% or whatever it is of oil that is used for electrical generation), at least until coal liquefaction could be stepped up. It would be a major, major crisis, yes, but hopefully it won't happen. Unless every single one of America's oil suppliers decide to stop exporting oil, we're looking at maybe a 5% decline per year, which is entirely manageable. Even 10% or 20% or 30% occasionally (as various suppliers cut off their exports) would be manageable. (2) All the oil is going to just disappear overnight. You said, "when there is not enough diesel to transport all the vital food and other goods around, the government will not have any spare diesel to move heaven and earth, either." Since when were we talking about a situation like that? It's Peak oil, not no oil. In fact, we're not facing any such situation until about 2040, by which time I imagine someone will have done something about it.